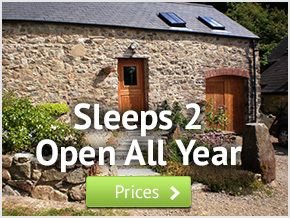 Y Bwthyn is a beautifully appointed cottage adjacent to Felin Isaf, the old Bishop’s cornmill. The self catering cottage is 10 minutes walk on a bridle track from the centre of St. Davids with its array of tasteful shops, pubs, first class restaurants and bistros serving local lamb, Welsh Black beef and locally caught seafood. The cottage sleeps two. The bedroom has a king-size double bed, which can also be separated to form twin beds. Though designed for an occupancy of two, the cottage does offer a travel cot for a baby. It has a bathroom with shower/sit and an open plan sitting room with a wood burning stove, central heating, washing machine, T.V,and DVD player. There is a well-equipped kitchen and dining area with a private patio and BBQ. A bookshelf is stacked with local maps, guides and reference books covering the cultural life of old and modern Wales.